Yahoo! Sports is breaking down each league for the upcoming college basketball season working backward from No. 31 to No. 1. Here's a look at our No. 1 league, the Big Ten. If a poor non-conference performance coupled with Indiana controlling its own destiny for the Rose Bowl has turned Big Ten football into a punchline, then at least the league figures to avenge those jokes in basketball this winter. No conference appears to be stronger at the top or deeper in the middle than the Big Ten, which should produce six or seven NCAA bids again this season and boasts eight or nine teams with legitimate hopes of getting there. For the first time since the days of Bob Knight patrolling the Assembly Hall sidelines in a red sweater, Indiana is the Big Ten's headliner again. The preseason top-ranked Hoosiers bring back All-American candidate Cody Zeller and nearly every other significant player from last year's Sweet 16 team and add one of the nation's best recruiting classes. Fittingly, it's the players who came to Indiana at the depths of Tom Crean's rebuilding efforts who have led this revitalization. Zeller and high-scoring Christian Watford form one of the nation's best frontcourt duos, Victor Oladipo is an elite perimeter stopper, Jordan Hulls shot 49 percent from behind the arc last year and versatile sixth man Will Sheehey provides scoring off the bench. Whether Indiana is a national title favorite entering March or merely just one of many contenders will likely depend on how freshman Yogi Ferrell adapts to the role of starting point guard and how much better the Hoosiers defend this season. Ferrell provides the creativity off the dribble and the ability to pressure the ball that Indiana lacked at point guard last season, but the highly touted freshman must play in control and make good decisions with the ball in his hands. He should help a defense that surrendered the most points and the highest field goal percentage in the Big Ten last year and did not cause many turnovers, forcing Indiana to outscore the opposition. The list of teams capable of challenging Indiana begins with last year's co-Big Ten champs: Michigan, Michigan State and Ohio State. With Trey Burke and Tim Hardaway Jr. returning in the backcourt and a loaded recruiting class including rugged 6-foot-10 Mitch McGary bolstering the frontcourt, Michigan could have the most talented roster John Beilein has ever coached. The toughness, leadership and outside shooting of Zack Novak and Stu Douglass will be missed, however, so the Wolverines will need others to collectively fill in the void. Speaking of holes to fill, Draymond Green's departure leaves a big one for Michigan State. Expect veteran big men Derrick Nix and Adreian Payne and athletic sophomore Branden Dawson to each become more vocal leaders and more productive scorers and rebounders in the frontcourt to make up for the loss of Green. Keith Appling should shine at point guard this season, as will top freshmen Gary Harris and Denzel Valentine on the wing. It's a testament to the talent Ohio State had last year that the departure of Jared Sullinger and William Buford won't necessarily knock the Buckeyes out of Big Ten title contention. They'll reload behind high-scoring forward DeShaun Thomas, defensive standouts Aaron Craft and Lenzelle Smith Jr. and a bevy of talented but unproven young players ready to assume a larger role. If anybody can break up that foursome and crack the top four in the Big Ten, Minnesota and Wisconsin are the most likely contenders. The Badgers have finished no worse than a tie for fourth every year in the Bo Ryan era, but they'll miss point guard Josh Gasser, who is lost for the season with a knee injury. Minnesota has underachieved in Big Ten play the past two seasons, but the Gophers return the young nucleus that led them to the NIT title game and bring back elite big man Trevor Mbakwe, who missed most of last season with a knee injury. Best shooter: Jordan Hulls, Indiana. Since Indiana's formidable offense has so many potent scorers, Hulls was left alone behind the arc last season more often than many of the nation's other top shooters. Credit him for taking advantage and making a ridiculous 49 percent (72-of-146) of his 3-pointers, so good that you had almost had to be surprised when he missed one. Best playmaker: Trey Burke, Michigan. So unheralded in high school that hometown Ohio State didn't even bother to offer a scholarship, Burke made those who passed on him feel very foolish with a brilliant freshman season. The sophomore averaged 14.8 points and 4.6 assists as a freshman, briefly flirting with the NBA draft last spring before ultimately opting to return to Michigan. Best defender: Aaron Craft, Ohio State. The Big Ten's reigning defensive player of the year is a nightmarish matchup for opposing point guards. Not only did he lead the Big Ten in steals last season and swipe the ball 16 times in five NCAA tournament games, he also is one of the nation's premier on-ball defenders on the perimeter. 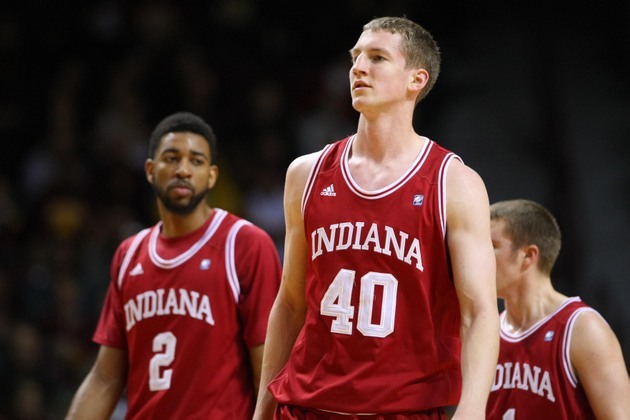 Top NBA prospect: Cody Zeller, Indiana. If Zeller isn't the favorite to be the No. 1 pick in next year's NBA draft, he's in the top three at the very least. The athletic 6-11 center needs to add strength, improve his defense and develop a mid-range jump shot, but no center in college basketball is more effective running the floor, taking his man off the dribble or scoring with his back to the basket. Best frontcourt: Indiana. In addition to the potential No. 1 overall pick in next year's draft in Zeller, the Hoosiers have some other weapons opposing teams have to worry about when game-planning. Christian Watford is a streaky scorer capable of erupting for 20 either from the post or the perimeter, small forward Will Sheehey is one of the best sixth men in the nation and bruising freshmen Peter Jurkin and Hanner Mosquera-Perea add toughness and defense inside, assuming they're both eligible. Best recruiting class: Michigan and Michigan State both signed exceptional classes, but neither had the depth of Indiana's. Although Jurkin and Mosquera-Perea will provide interior depth this season and step into larger roles the following year, the immediate standout will probably be point guard Yogi Ferrell. The Indianapolis product will start from day one, giving the Hoosiers a point guard who can create off the dribble and pressure the ball, both facets they lacked a year ago. Coach on the rise: Fran McCaffery, Iowa. The former Siena coach showed why he was so highly regarded with the Saints by rebuilding the suddenly fun-to-watch Hawkeyes in two years, earning a seven-year contract extension in the process. Iowa has a chance to return to the NCAA tournament this season for the first time since 2006, but the strength of the conference may force the Hawkeyes to wait one more season. Coach on the hot seat: Tubby Smith, Minnesota. The bad news is Minnesota fans will grow very restless if the Gophers continue to make headlines for off-the-court problems or don't make the NCAA tournament this season for a third year in a row. The good news is Smith has all the talent he needs to get there with the young nucleus that led Minnesota to the NIT title game returning and star big man Trevor Mbakwe also back from injury.